Overview: This is a very easy hike down a wide dirt road that leads to a pump station on the north end of San Joaquin Rd. 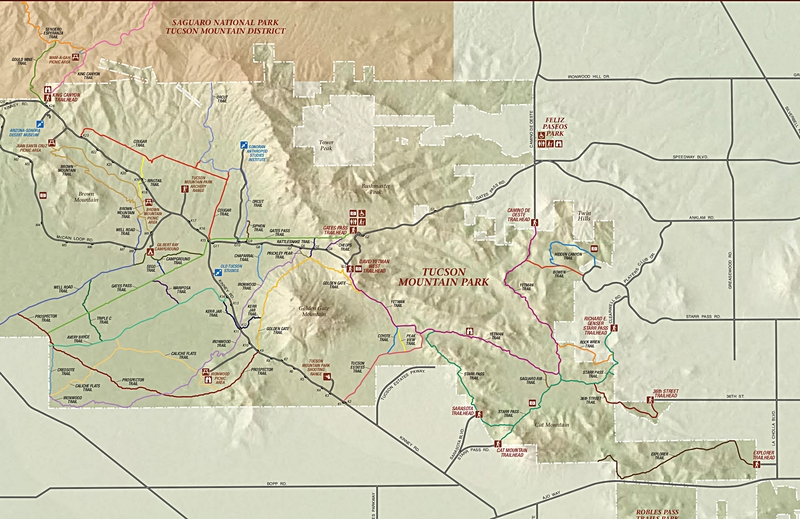 Although not a trail in the typical sense, it is labeled as one on the Tucson Mountain Park map, and does provide access to several other trails in the area. Hike: From the pull out, walk around the locked gate and follow the dirt road as it heads west. Although rocky, the road is wide and easy to follow as it slopes gently downhill towards San Joaquin Rd. I believe this trail would make an ideal location for an evening stroll to watch the sunset, or a great introduction to night hiking due to how easy the trail is to follow. Pay special attention to the south sides of the road as you walk, and you will notice several trail junctions marked with cairns. 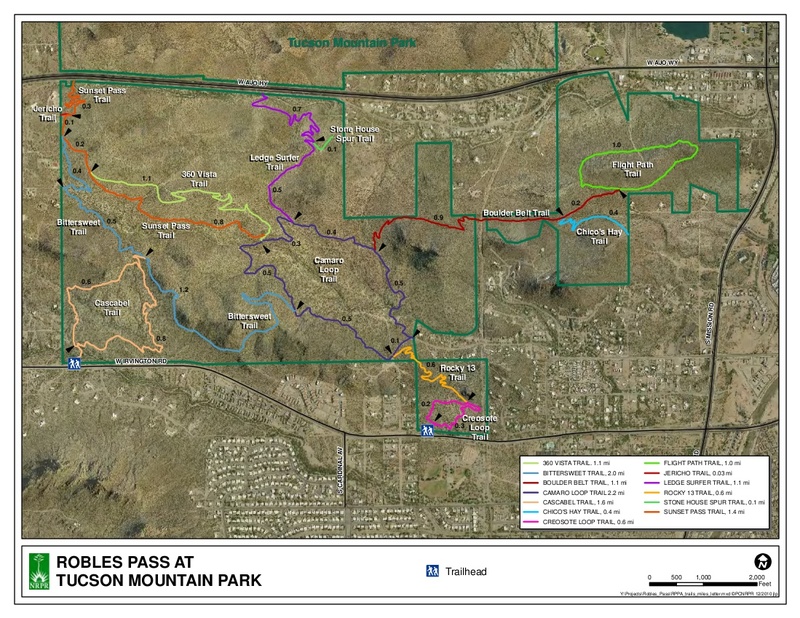 Although none of these junctions are signed, the Tucson Mountain Park map names these trails. In the order you will encounter them, they are: Campground Trail, Triple C Trail, and Prospector Trail. The end of the trail/road is less then spectacular, as the road ends at a large fenced off water pumping facility. Despite the lackluster finish, the trail provides decent views of the Tucson Mountains and Gates Pass. From Speedway & I10, travel west for 4.6 miles to where Speedway becomes Gates Pass Rd. 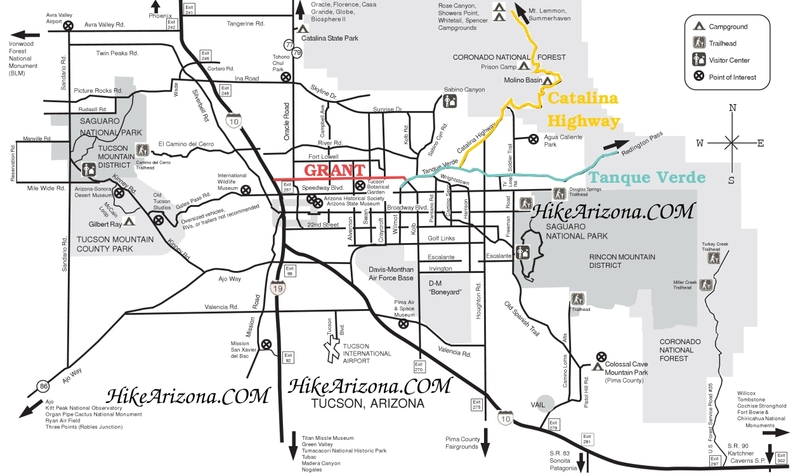 Continue on Gates Pass Rd for an additional 4.7 miles to Kinney Rd. Turn right on Kinney Rd and travel .6 miles to the lower intersection of McCain Loop Rd. Turn left on McCain Loop Rd and travel .7 miles. The trailhead will be the second pullout you encounter on the south side of the road and is the only one with a large yellow gate. The pullouts are not marked, so be sure to start counting them as soon as you pull on to McCain Loop.